Don’t forget, folks! 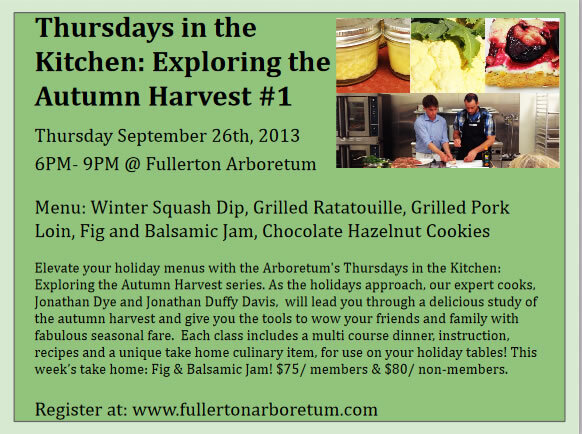 The Jonathans are back on Thursday nights at the Fullerton Arboretum this fall! Our three part, holiday focused cooking series kicks off this week with an Early Fall Dinner Party. The menu which includes winter squash dip, grilled ratatouille, savory grilled pork loin and chocolate hazelnut cookies, will be complemented by white lillet cocktails. A special feature of this Autumn Harvest series is that each class member will get to take home a special, hand crafted item, and receive full instruction on how to make that item at home! This week’s special take home is Fig & Balsamic jam, of course made by the Jonathans! This amazing and unique jam can be used in a variety of ways in your holiday meals. Come to class to get the details and claim your very own jar! The direct link to sign up for class is right here. Just be sure to select the proper date. Remember that your purchase supports the Fullerton Arboretum’s education program! The October Thursdays in the Kitchen class (10/24) will focus on a fabulous Thanksgiving meal, and the November class (11/21) will explore an exciting Christmas / New Years meal. Menus for both will be released soon! Fresh cut salsa, made using local, organic vegetables and fruits! Jonathan Dufffy Davis prepared the plank. The Jonathans prep a streusel. Four types of basil grown right here at the Fullerton Arboretum went into dishes made in class. Jonathan Duffy Davis cuts the cake during a winter Thursdays in the Kitchen. Folks enjoying their meal during class! Nectarines, blackberries and sweetness. This tastiness went into the crostata dessert during the 4th of July Backyard BBQ. Outside classes kept us cool in warm evenings. Everyone gets a recipe packet to take notes and to take home! This spring time class was conducted in the Potting Shed. Jonathan and Alicia whipped up some down home goodness. Some of the amazinf Arboretum Produce that is featured in our menus. Believe it or not, this drink came with educational advice! Berries for Dessert. Who remembers this! Jonathan Duffy Davis enjoys mixing our tropical sangria during the 4th of July back Yard BBQ class! Jonathan Dye crafts the Stone Fruit Crostada like nobody’s business. Caprese Skewer. This was a tasty one. Look at these monsters! Grown onsite at the Fullerton Arboretum by Farmer Jonathan Duffy Davis. Next Next post: Thursdays Recap: Early Fall Dinner Party!